Ok, technically it was on my way back from the store, but the police were getting in position when I left the hotel, so I know another protest was about to begin. I was secretly hoping I’d see the march the way home. Luck was on my side! 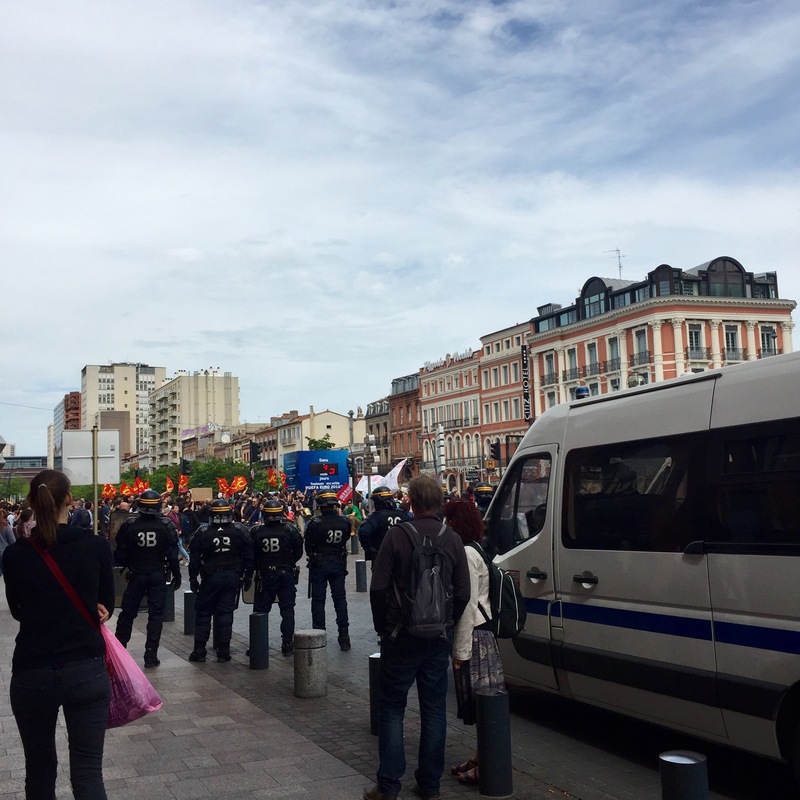 Over the past month, there have been numerous protests throughout the country about new French labor laws. 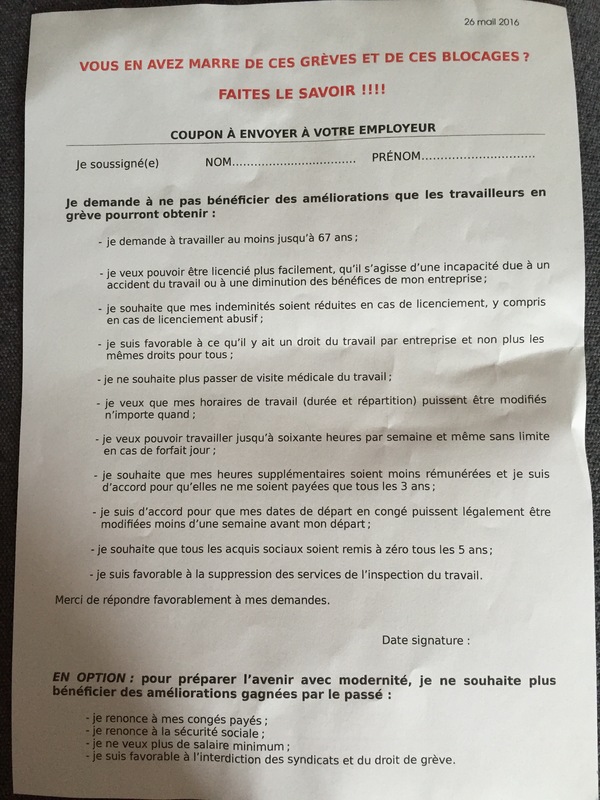 Today, from what I was told at the front desk of our hotel, the taxi drivers, bus drivers and train operators were waging their own grève (or strike) against the changes. I’m lucky to be able to walk most places I need to go right now, but a lot of the people in my French class (including our professor) have experienced the frustration of a limited bus and train schedule and long drives due to blocked roads around the city. One of my professor’s colleagues sat in traffic for two hours one morning this week because of a blocage (obstruction) at one of the roundabouts entering the city. The protests here can get pretty heated, so the police are out in full force, many in full-body protective suits and carrying shields. It’s kind of intimidating to see–but I guess that’s the point. The trail of police following the end of the march. A man walking with the protest handed me a letter the protestors want given to employers with terms they approve. This includes wanting the ability to work until at least 67-years-old, not wanting to have to pass a medical exam to work and wanting to be able to modify work schedules whenever necessary. There are strikes from time to time in the U.S., but France really has them down pat. I admit, watching the strike was even more interesting and entertaining than watching a parade. Such passion! Such color! Such résistance! Here’s a little video so you can see for yourself.